The uncle of the boy said police first detained his nephew before shooting him at point-blank range in front of dozens of other protesters. Police said they would investigate the uncle’s allegations while admitting that officers had breached normal protocol and saying they regretted the incident. The shooting happened during a protest on the outskirts of Srinagar against a government crackdown on Kashmiri leaders – the second day of violent clashes in the disputed Muslim-majority state. “The boy died of bullet wounds,” Aijaz Mustafa, a local hospital spokesman, told AFP. Three others were also wounded, witnesses said. “The police officer took my nephew aside and then shot him point-blank as we watched,” Tariq Ahmed Sofi, the boy’s uncle, told AFP. Javid Gillani, inspector general of police for the region, told AFP: “If that is true it will come out. “We will speak to him (the boy’s uncle) and investigate his version of the boy’s killing,” he added. A separate police statement appeared to admit that there had been police wrongdoing. We “regret the unfortunate incident”, the statement said. “A preliminary enquiry conducted into the matter indicates that the forces deployed have acted in violation of the laid-down SOP (Standard Operating Procedure),” it added. 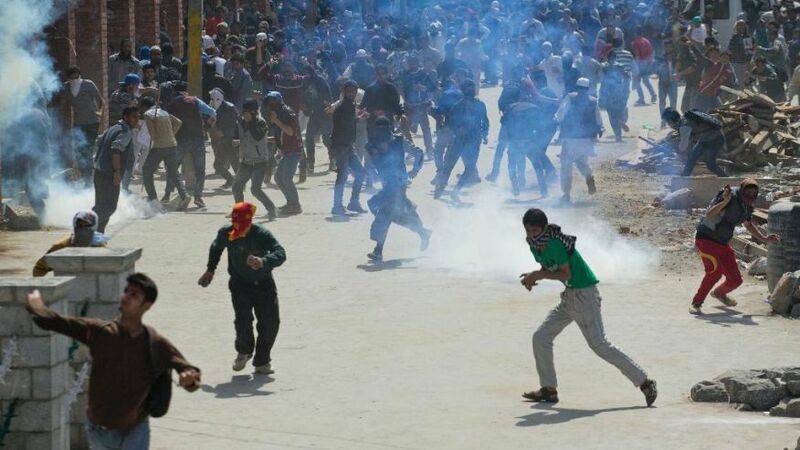 Indian Occupied Kashmir has been rocked by violent protests this week after the brother of a top Kashmiri leader was killed by the army near the town of Tral in the south of the Kashmir valley. Shops, businesses and schools remained shut on Saturday across several towns in the state in response to a strike led by top APHC leader Syed Ali Geelani against what he called “state terrorism” and “poisonous propaganda” by Indian media. Authorities have put all top Kashmiri leaders under house arrest to prevent them from leading protests. On Friday, 30 people, mainly police officers, were injured as pro-Pakistan demonstrators set fire to an Indian flag and hurled rocks at them as protests over the arrest of another Kashmiri leader turned violent. Masarat Alam Bhat was arrested Friday, two days after he raised pro-Pakistan slogans at a peaceful rally in which activists waved Pakistani flags. Bhat rose to prominence in 2010 when he organised a series of mass protests before being detained without charge for four years under controversial public safety legislation. Anti-India sentiment runs deep across Kashmir. This entry was posted in Asia Pacific, Pakistan News and tagged Indian flag, Indian Occupied Kashmir, Kashmir valley, Kashmiri leaders, Occupied Kashmir, security forces, Syed Ali Gilani, Tariq Ahmed Sofi, violent clashes, Youth. Bookmark the permalink.